Tired of your monopropellant rockets being left out in the sound department? This adds a sound effect when firing RCS engines, varying in pitch and intensity with monopropellant usage. It can be useful to tell just how much SAS is burning through your reserves without even a glance. The sound file can be changed in the cfg file. Source included, project also available on github, licenced under GPL v2. ModuleManager is required for this mod to work. Download it here. Thrusters light up any area they hit. Sounds for the EVA jetpack. Fixed crash on hovering the mouse over RCS parts. Added partial support for the new ModuleRCSFX thrusters. KSP 1.1 (pre-release build 1183) support. Fixed issues with effects not being loaded correctly. Added more detailed documentation on options. Fixed typo in error message. Added changes by FreeThinker providing support for RCSFX and other derrivatives of ModuleRCS. Included a cold gas RCS thruster sound as an alternative. Removed Module Manager. This should be installed separately. Fixed errors with light effects disabled. Upgraded to Module Manager 2.509. Upgraded to Module Manager 2.3.5. Fixed internalRcsSoundsOnly not working correctly. Rebuilt for the ARM pack (KSP 0.23.5). Fixed light effects not being disabled when the thruster runs out of fuel (thanks to BigNose for the bug report). Fixed debug text appearing in the output log (thanks to Tabakhase for the bug report). Removes dependencies on a hard coded resource name and the replacement of ModuleRCS for better support of mods which change the resource system such as Real Fuels. Added improved sounds by Daishi. Added light to the RCS effects (thanks to taniwha for providing some pointers on this). Fixed sounds continuing to be played on pause. Fixed multiple simultaneous RCS firings resonating together. Fixed sounds continuing to play quietly while idle with SAS and RCS enabled. Added support for KSP 0.22. Should work with any future 0.22 patches also. Now using ialdabaoth's ModuleManager and sarbian's ModuleManager Extension. This means that you no longer need to edit part.cfgs to add RCS sounds to parts, stock or modded (assuming they use ModuleRCS). Thanks to mwlue for help with setting this up. Added the option to only hear RCS sounds in internal views. Added the option to make the volume fade off at low thrust values. Fixed sound path issue (paths shouldn't be wrapped in quotation marks). Awesome! It always seemed so weak without sounds. I'm downloading now. Nice, for some reason it says "Buy Now" instead of download on Spaceport, but, well, Spaceport. "Buy Now"? That's weird. It shows up as "Download Now!" for me. I did see another mod today that said "Buy Now", though clicking on it just gave the download as normal. It should still work ok.
Spaceport does that lately. I think they're not fixing it simply because they're completely redoing Spaceport. Cool idea, but couldn't you use ModuleManager to add the sounds to the configs? I don't like the idea of modifying Squad's configs. Also, why an uncompressed WAV file? Why not MP3 or OGG? I realize it's only 357KB, but every byte counts. Never mind my nitpicking though. Great work! 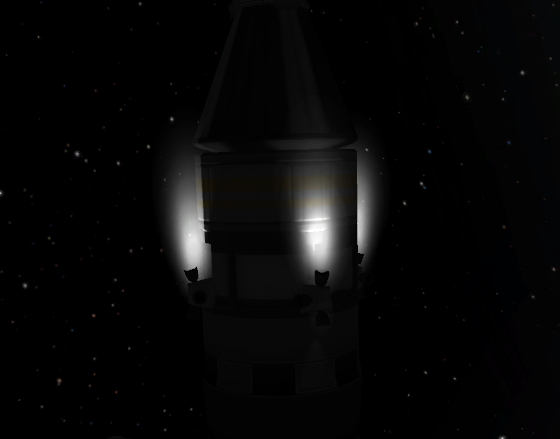 I just made one that includes stock, KWRocketry, B9Aerospace, Kosmos, RLAStockalike, FASA, the Orion Service Module from the American Pack and one weird thing from Nautilus. OP, if you'd like it, PM me your email add. Any chance of a video? This is funny. If Squad used the sound, people would be whining about "no sound in space" and mods that remove the "KSSSS" would be made. I like silence, it's realistic. RCS thrust can't be heard even if you'd put a mic a metre away. Gas dissipates so easily in vacuum. Basically few centimetres away from the nozzle there are no sound waves anymore - molecules just fly away like bullets. Well, the inside of most spaceships (at least the manned ones) are not a vacuum, and sound travels quite well through metal or other solid materials that rockets tend to be mounted on, so silent spaceships are extremely unrealistic, at least from the perspective of the people inside. Not being able to hear a nearby spaceship is realistic, not being able to hear your own spaceship is not. I can't say for sure, but I don't think you can hear RCS from your compartment in the craft. The sound is produced at the very exit hole of the tiny nozzle, and the amount of gas is very small. Maybe, if everything was completely silent, you might hear a weak and deep puffing sound. Can you link the video? No, I sincerely doubt a mic could pick that up. Microphones need soundwaves or, in this case with the vacuum, a very intense stream of gas. You're forgetting that the surface area of a mic is very tiny, and solar panels' is huge. They will be a lot more affected because they're pushed. Mic needs its membrane to vibrate. Not the same thing. The two shuttle videos I could find showing RCS firings were completely silent. The shuttles a big ship, Im sure you'd be able to hear something if you were close enough, but it seems they are surprisingly silent. Apparently they're pretty hard to see them firing unless its dark too. Speaking of which, when you have an attitude control system active, such as mechjeb, the RCS emits a constant "HSSSSSSSSHHH". I know thats the mods functioning correctly, but is there any way to make it less annoying? Maybe have the volume taper off and the sample not loop, so the sound would only play for a lengthy-but-limited time for each pulse? Do they call it a "ship"? I intended to use ModuleManager, but I didn't see a way of replacing one module with another, keeping the old one's configs. I'll look into it a bit more when I get the chance. There were some issues with MP3s the last time I tried them, many releases ago. I'll see if I can switch to some kind of compressed format. RCS jets aren't gas valves, they're monopropellant rocket engines. They burn at high temperatures, just like main engines do. See the video below. Hoojiwana actually has some monopropellant main engines here. This was my main reason for making this mod. I actually have a proof-of-concept mod that makes all craft sounds gradually fall off to nothing in vacuum from before I conceived this mod. I might clean it up and release it at some point, but in the meantime NovvaSilisko has released something similar here. The mod actually does taper off the volume at the moment. I'm looking to find a balance between not being annoying and still letting you know that mechjeb is wasting your monopropellant. I'll look at decreasing it further, or making the volume scaling and looping cfg options. The excellent video posted above by pizzaoverhead clearly indicates that the RCS thrusters to make sounds, so one would DEFINITELY hear them firing from inside a small capsule or spacecraft due to hull sound-conduction. Just like one would hear rockets and main engines firing. Yes, if the game were totally 'realistic', one should only be able to hear these sounds when in IVA, and when the viewpoint is from outside everything would be almost completely silent. But I consider that, even when 'I' (the player) am viewing the ship from outside, 'I' am actually inside the cockpit controlling it, hence the navball and other instruments available to me. Third person view is simply a game mechanic. So yes, I'm all in favor of this mod, and will use it ASAP. Actually, you can hear the RCS firing from inside the Shuttle. Surprisingly, it's not a "HISSSSHHH" of the jet as in this mod, but rather "Clang" of the valves operating. They would hiss when in atmosphere, but in space, you only hear them clang. Sound in KSP, in general, isn't really realistic. While you definitely can hear your own engine from inside the cockpit, it's much different (and quieter) than what you hear in atmo. The jet itself doesn't really transfer energy to the ship, but the turbopumps and other moving parts do make quite a racket. Still, it's pretty muffled unless your engines are on the command pod. Sound generated by engines should differ based on atmospheric density and Mach number. For example, if you go over Mach 1, sound from your own engine stops reaching you through the air, but still does through the airframe. Also, plenty of other stuff can make cabin noises, including life support system and reaction wheel motors (if they're large enough). And of course, that's all without mentioning the fact KSP allows you to hear other craft in space... Just fire off retrorocket-equipped stage and hear it burn. In reality, there'd just be a clang sound of the decoupler firing. This should add RcsSounds to all rcs pods with ModuleExtension. Fuel-oxidizer systems by their very definition can not be monopropellant. They contain two compounds (plus compressed helium as a carrier). Apollo's RCS was therefore bipropellant. Some/most RCS systems in real life are bipropellant, and there are systems that use only one compound and are therefore monopropellant. Monopropellant RCS has lower specific impulse and is suitable for less demanding purposes in real life. Whether it's mono- or bipropellant, the sound is very much the same. Outside the craft it's complete silence except at the nozzle, and inside the craft it's probably so muffled and low that you can't hear it over the sound of all the CO2 fans and other stuff working. Even if it's probably hard to hear or completely undistinguishable, I agree it would be nice if we could hear at least something, but only while commanding that craft. Yes, mechanical stuff with the nozzles, that's expected. The actual hiss is unlikely. I remember reading about the ascent modules of the lunar landers. The chamber was almost inside the vessel. I think they could sit on it, and it was very loud, something their microphones couldn't pick up much, being designed for higher frequencies. Because no, every byte does not count. WAV has so much advantages compared to MP3/OGG with small sizes, making it the file type for sounds. If you check out every sound in almost every game, they're all in WAV format. Of course, for longer audio sequences MP3 is definitely better if quality is not the main problem. I said that every byte does not count because we're today at 2 Tb HDDs and 512 Mo (or more?) SSDs. It is not half a megabyte that will be critical. If you speak about RAM, then formats other than PCM (uncompressed sound file) is not welcomed then, because you load the compressed file into ram and then uncompress it to PCM format. Thanks, I'll see if I can add something like that for the next release! I'm not set up for recording videos at the moment, but if anyone else wants to make one, I'd be happy to put it in the main post. All volume channels are at max and I cant hear a thing when i'm RCS'ing around. Sorry to hear that. Have a look in KSP_Data\output_log.txt for any mention of "RcsSound". Any errors should show up there. Are you using the stock RCS parts and able to see the graphical effect when you fire them? What operating system are you using? Non platform assembly: E:\Games\Kerbal Space Program\KSP_0.21.1\GameData\RcsSounds\Plugins\RcsSounds.dll (this message is harmless)"